Step on inside Dobson's, a San Diego landmark where prominent clientele have gathered for food and libations for over three decades. Situated within the beating heart of the Gaslamp, folks have made Dobson's a tradition for lunch, dinner and cocktails in America's finest. And for good reason. There's a sense of classic coziness at Dobson's, where guests are surrounded by warm, wood-paneled walls, stained glass and plush furnishings. Our bar is welcoming, reminiscent of an old-fashioned men's club. But don't think for a moment that women aren't a cherished presence here, too. Located within a block of the Civic Theatre, Balboa Theatre and the Lyceum, Dobson's is a magnet for theater-bound patrons in search of a pre-show dinner, or to wrap up a memorable night on the town. Pull up a seat at the bar, or reserve a table for your party. 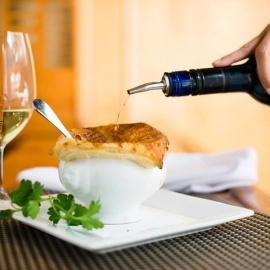 Let us do all the work, whether that means crafting a classic cocktail for you and someone special, or having our world-renowned chef serve up one of his popular specialties, such as creamy Mussel Bisque or a savory pan-roasted Chilean Sea Bass. Although the downtown area has changed throughout the years, we remain committed to upholding our reputation as an award-winning destination that promises fresh contemporary American cuisine in an inviting atmosphere. No matter whether you're a seasoned San Diegan, or a visitor from across the globe, there are good times in store for you at Dobsons. 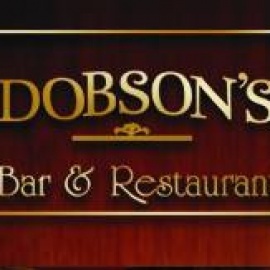 Dobson's Bar and Restaurant is a hidden treasure in the heart of Downtown San Diego/Gaslamp Quarter. For the last 33 years, this has been the hot spot for business lunches and frequented by many local and nationwide celebrities.